Rutland Fire Clay Company was founded in Montpelier, Vermont, in 1883. Its first marketed product was a stove lining intended to reduce soot buildup and make stoves more efficient. The company gradually branched out to make stove polishes, home repair items and construction materials. Rutland is now headquartered in Chapel Hill, North Carolina. Products are made and shipped from Jacksonville, Illinois. The company devoted a large portion of its early investment to controlling creosote – a combustible byproduct that tends to build up in coal and wood fired chimneys and stoves. 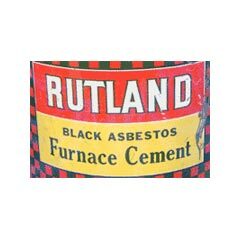 Many of Rutland’s products during the early 1900s were designed to reduce soot, thereby simplifying home fireplace maintenance. These items also made Rutland very popular when shortages during World War II saw increased wood stove usage. Rutland’s focus on manufacturing large lots of construction products made low-cost asbestos a desirable choice. Asbestos was a popular fill used in patching compounds and cements that were designed to stand up to high temperatures. Exposed to Asbestos at Rutland Fire Clay Company? From 1984 to 1999, 50,000 asbestos-related cases were filed against Rutland. Company president Thomas Martin testified before Congress in 1999 and estimated Rutland’s liability for current and future asbestos claims at $67 million. Rutland had 37,000 pending cases and $3 million in assets when it filed for Chapter 11 bankruptcy in October 1999. Martin said asbestos claims were the sole cause of the bankruptcy. The company set up a trust fund in 2000 to deal with past and future claims. Claims are accepted only part of the year and settlements are subject to fund availability. Two cases demonstrating types of asbestos-exposure from Rutland products involved Ethel Scheidel and Kenneth Cobb. In a 1997 New York Supreme Court case, Ethel Scheidel filed a claim against Rutland Fire Company, on behalf of her husband, Victor Scheidel. Victor encountered asbestos while working as an independent contractor and was later diagnosed with asbestosis. In 2001 Owens Corning Fiberglass added Rutland as a party defendant in a case where a pipefitter, Kenneth Cobb, developed asbestosis. Cobb spent 40 years using asbestos insulation and wallboard for refrigeration, air conditioning and heating systems and pneumatic control systems. Cobb received $689,782 in compensatory damages. Asbestos issues are not the only problem Rutland has dealt with in recent years. In 2016, Rutland paid a fine of $1,000 to the California for violating health and safety codes when it didn’t properly label its Safe Lite Starter Squares, which had the potential of releasing toxic chemicals into the air. In 2008, Rutland was fined $10,000 by the California Air Resources Board for distributing its One Match Gelled Fire Starter without proper certification. Construction workers and mortar and brick layers who used older asbestos-containing cement products manufactured by Rutland were likely exposed to asbestos. Rutland made materials with both raw asbestos and asbestos minerals found in rocks from the Vermont area. Factory workers preparing these cement products could also suffer from asbestos exposure. Some of these products contained up to 10 percent chrysotile asbestos. When homeowners or construction workers remodel, drill, saw or break through walls or panels to access crawlspaces, they can damage the products and release asbestos dust. Inhaling these particles over years is the primary cause of mesothelioma. Congress. (1999). Congressional Record Proceedings and Debates of the 106th Congress First Session V. 145, Pt. 19, October 26, 1999 to November 3, 1999. 26721-28315. Flick, E.W. (1988). Construction and Structural Adhesives and Sealants: An Industrial Guide. Park Ridge, NJ: Noyes Publications.